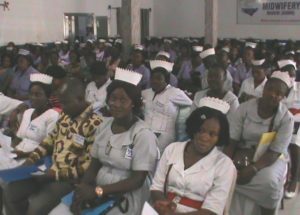 The Sierra Leone Nurses Association (SLNA) has held its Annual Conference and Scientific Symposium on the theme: “Nurses a Voice to Lead, Health is a Human Right” on Wednesday, May 9, 2018, at the School of Midwifery, Masuba in Makeni, northern Sierra Leone. In his keynote address, the Chairman, Human Rights Commission of Sierra Leone, Rev. Dr. Usman Jesse Fornah commended the Sierra Leone Nurses Association as they joined colleagues worldwide to celebrate the International Nurses Day on 12th May every year, and to commemorate the birthday of the founder of modern nursing, Florence Nightingale. He informed his audience that this year’s theme indicates that nurses have a pivotal role to play in the protection and promotion of human rights, particularly in the health sector. Rev. Dr. Fornah reiterated that the right to health means that everyone has the right to the highest attainable standard of physical and mental health, which includes access to all medical services, sanitation, adequate food, decent housing, healthy working conditions, and a clean environment. Deputy Chief Nursing and Midwifery Officer1, Amba Coker, said there was a robust reforms taking place in the Ministry of Health and Sanitation and the Directorate of Nursing and Midwifery Services is no exception. The Deputy Director of Human Resource for Health, Mr. Emile Koroma, while dilating on recruitments said even in the midst of moratorium of recruitment, a lot has happened on the area of recruitment. He told the gathering that recruitment is not just about taking somebody from outside but even giving promotion is recruitment, adding that a lot has been recruited especially in the area of State Registered Nurses and Midwives among others. He said presently they have over three thousand State Enrolled Community Health Nurses (SECHN) applications waiting for recruitment and most of them contributed in ending the Ebola outbreak in the country. The President of the Sierra Leone Nurses Association (SLNA) Senesie Margao said access to health care is a fundamental human right, enshrined in international treaties and recognized by government throughout the world, and nurses are central to ensuring that access within the health care settings. He said as a parent body, the International Council of Nurses (ICN) views health care as a right of all individuals, regardless of financial, political, geographical, racial or religious considerations. Mr. Margao reminded colleagues that as nurses their actions and utterance can determine the extent of patients’ access to health, adding that their critical role of control can frustrate or facilitate the patients’ access to health which is a basic human right. He noted that nurses who deliver the majority of health care services in collaboration with colleagues in both health and non-health sector, have an important role in ensuring that health is a human right. Speaking on behalf of the West Africa College of Nursing (WACN), Sierra Leone Chapter, Josephine Jenneh Saidu said the WACN is a professional nursing body aims at maintaining standards in the nursing profession in the sub-region. She stated that the college is committed to support the Sierra Leone Nurses Association and the entire nursing profession to promote and maintain the requisite standards in the profession. The National Organising Secretary of the Sierra Leone Health Services Workers Union, Shiek Mamoud Sesay said nurses are the central pillar in the health sector, as they do great sacrifice in order to save lives. He said the union is aware of the many challenges nurses faced while performing their duties, and appealed to government to consider employing these thousands of volunteered nurses who worked day and night during the deadly Ebola outbreak because it is their human right and must be uphold. As an Independent Nation from colonnialism and a Republican nation just like the USA, should WE still keep our colonial master’s relics, such as “Midwives” instead of “Nurses”; the wearing of dirty, stinking wigs under 90+º weather by our legal practitioners and Judiciary? Are we not Independent? Can WE, as a nation state, follow the foot steps of the USA to shed all forms of our colonial relics and create our own way of doing things? Yes, WE can. America became great because she shed off all colonial attachments and created the world greatest and wealthiest nation on earth. Commonwealth African country will only become great when we, first of all, disown the CW (the wealth is not even common); create our own value systems – in our educational, judiciary, social structures, and transport system – right hand driving, etc. Africa will become a United States of Africa if we only follow the trails of the United States of America. Something AU and our leaders to ponder about.